This gig is taking place on Record Store Day featuring performances from some of Ireland's best acts including Pillow Queens, Squarehead, God Knows (Rusangano Family) and Tebi Rex. Competitions 11 January, 2019 . Written by Katie Donohoe. Dublin Is Sound is an all-ages daytime gig open to 14s+ & to under 14s if accompanied by a guardian. 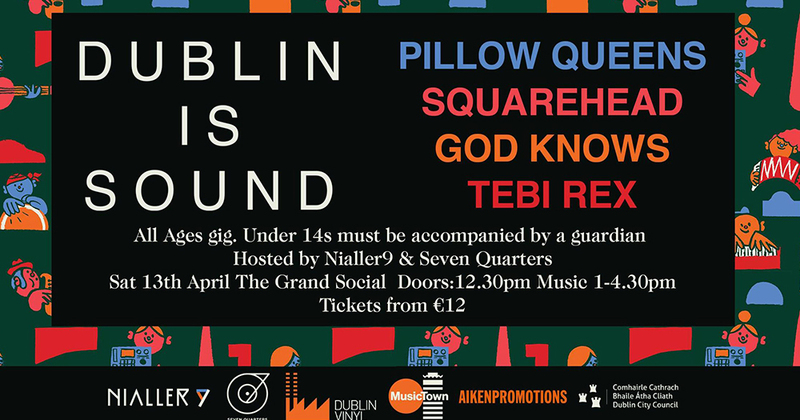 This gig is taking place on Record Store Day featuring performances from some of Ireland’s best acts including Pillow Queens, Squarehead, God Knows (Rusangano Family) and Tebi Rex. The gig will give those attending the opportunity to witness four of Ireland’s best new music acts and to start their vinyl collection. Advance ticket buyers will receive a limited edition 12″ vinyl record on the day featuring tracks from the acts. The vinyl is pressed in the city by Dublin Vinyl with specially-designed artwork by Dublin based designer Ruan Van Vliet in response to the music. Earlier this year, Gay Girls by Pillow Queens was amongst the nominees announced for the RTÉ Choice Music Prize Irish Song of the Year 2018. The video for ‘Gay Girls’, which was directed by Kate Dolan, sees a young girl about to make her Holy Communion, but she cycles away from her arguing parents and joins her other friends dolled up in their communion dresses to go on adventures for the day. 11 January, 2019 . Written by Katie Donohoe.